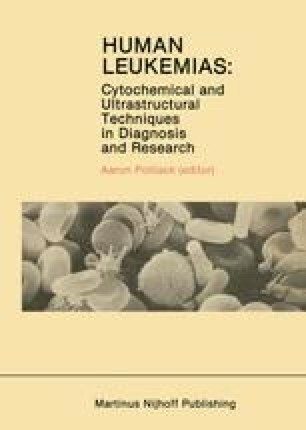 Prolymphocytic leukemia (PLL) is a distinct variant of chronic lymphocytic leukemia (CLL) [1, 2]. Although PLL may be suspected in patients with massive splenomegaly and lymphocyte counts over 100 × 109/1, the diagnosis can be made only by identifying the prolymphocyte as the predominant cell in well-prepared peripheral blood films. The typical morphological features of the prolymphocyte—namely, larger size than a normal blood lymphocyte (or CLL) slightly more cytoplasm, and a prominent nucleolus—are best appreciated at ultrastructural level [1, 3–7].